People are usually recovering from an injury in one way or another. Whether a person is an Olympic tri-athlete who has a torn ligament, or an individual who is recovering from an operation, physical therapy will most likely be prescribed. As part of the rehabilitation, especially early on, the physical therapist may apply a unique tape that is likely to reduce your pain level, as well as increase your recovery time. The tape is called Kinesiology Tape. The philosophy behind this tape is to provide additional support to injured joints and strained muscles, similar to prior taping methods that coaches and trainers used on professional athletes. The kinesiology tape was developed back in 1979 by a chiropractor. It wasn’t until the Olympic games in 2008 that the public, as well as the medical field, took notice of the tape. So, exactly how does the kinesiology tape work and how does it promote healing? Kinesiology tape is fashioned out of a combination of flexible, cotton cloth that is meant to resemble the skin’s natural elasticity. This material is also breathable, which means that air passes through the cotton material and perspiration can evaporate. This is an excellent feature of this tape, especially if you’re a person who sweats a lot. The kinesiology tape is designed to stimulate the lymphatic system, which is throughout your body. The tape gently lifts the skin, thus increasing blood flow moving through your circulatory system and provides necessary oxygen to the injured area. As the tape lifts the skin, it also stimulates the fluids in the lymphatic system which helps to alleviate swelling at the injured site. Kinesiology tape also helps to reduce pain because the tape reduces the swelling that triggers pain. This unique tape promotes healing because it encourages the body to heal itself. When the tape is applied to the skin, it is gently pulled taught, and a gentle, steady pressure is on the injured area. In layman’s terms, the constant pressure signals the brain that the injured area needs extra attention. Therefore, healing begins. 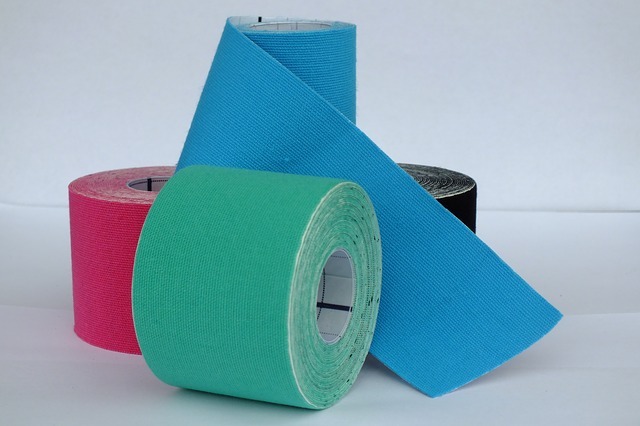 It is important to bear in mind that although this tape has provided much relief for many people, many physical therapists do not rely on kinesiology tape alone for an individual’s therapeutic treatment. Kinesiology tape is available in an assortment of bright colors, in addition to the traditional black. The colors do not indicate the strengths of the tape in any way and are strictly meant to add flair and variety.